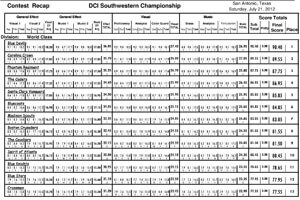 The DCI Southwestern Championship at San Antonio's Alamodome on Saturday, July 21, was the first show of the season with all World Class corps in attendance. (Pacific Crest, Jersey Surf, Mandarins and Pioneer all joined the tour this week. None of those corps were in Minneapolis a week ago.) In addition, four Open Class corps competed; three of them from the host state of Texas. The only difference between this show and last week's DCI Minnesota event was the addition in San Antonio of a second judge in both General Effect Visual and General Effect Music. Most notable among the results was Blue Devils being the first corps to break 90 points while topping Santa Clara Vanguard's drum line. (BD's line had been within 0.10 in Minnesota, but SCV's line was dominant all season). Carolina Crown remained within a point of BD in overall score, and Phantom Regiment topped the Cadets. Madison Scouts jumped in front of the Cavaliers by being the corps to most increase its score from Minneapolis (a significant 5.30 points) despite placing 14th in Color Guard, (down from 9th in Minneapolis). Crossmen came within 0.40 of a top-12 position, and Oregon Crusaders received a five-point penalty after stepping off more than three minutes late due to their color guard arriving to the field late. As always, please keep in mind that the scores of the two General Effect captions are counted for full value, while the scores of the three Visual and three Music captions are divided in half before being added to the final score, with each of those half scores then added for the Total Visual and Total Percussion score. This is so that the judges can judge in tenths and not hundredths of points, on a scale up to 10 and not up to 5. Blue Devils (1st-90.40) took first in Visual Effect and all three Visual captions—Proficiency, Analysis and Color Guard. They tied Crown for 1st in Music Effect and took first in Percussion, but placed 2nd in Brass and Music Analysis. Percussion outscored SCV's line by 0.10, the same margin it lost to SCV a week ago. The two 2nd place finishes were both under those of Crown. Carolina Crown (2nd-89.55) tied for 1st in Music Effect and took 1st in Brass and Music Analysis. 2nd place was earned in Visual Effect, Visual Proficiency and Color Guard. Last week's 4th place in Percussion was raised to 3rd place, and Visual Analysis dropped from 2nd to 3rd place. Phantom Regiment (3rd-87.75) took 2nd in Visual Analysis, but 7th in Percussion. Brass and Music Analysis placed 4th, with all other captions finishing in 3rd. Besides the 1.40 spread in Percussion, no other caption was more than 0.50 out of 1st place. The Cadets (4th-86.95) was as high as 3rd only in Brass and Music Analysis. Visual Proficiency and Color Guard placed 5th, with all other captions finishing in 4th. The corps dropped an additional 0.95 behind BD since Minneapolis, the same number as the change in score between the corps and Regiment. Santa Clara Vanguard (5th-85.85) took 2nd in Percussion by 0.10, but 7th in Brass. Visual Proficiency and Color Guard finished 4th, with all other captions in 5th. Bluecoats (6th-84.85) was 5th in Brass, Percussion, and Music Effect, 6th in Music Effect and Music Analysis and 7th in all three Visual captions. In Minneapolis, the corps didn't finish below 6th in any caption. Madison Scouts (7th-83.05) finished 6th in Visual Proficiency, Visual Analysis and Brass, Visual Analysis moving up from 11th in Minneapolis. 7th was received in both Effect captions, moving up from 11th in Visual Effect last weekend. 8th was taken in Music Analysis and Percussion. But Color Guard dropped from 9th last weekend to 14th. Boston Crusaders (8th-81.55) moved up to 6th in Color Guard from 10th a week ago. 7th in Music Analysis was followed by 8th in Music Effect and a tie for 8th in Visual Effect. Visual Proficiency and Percussion placed 9th and Visual Analysis and Brass 10th. The Cavaliers (9th-81.50) fell from 4th to 6th in Percussion and 6th to 9th in Visual Analysis. Visual Proficiency placed 8th, Visual Effect 10th and all other captions 9th. Though in ninth, the corps will still be performing in Murfreesboro next Friday. The show is a Tour of Champions series event, unlike the top-8 format used up through 2010. Spirit of Atlanta (10th-80.45) tied for 8th in Visual Effect and took 8th in Color Guard and Brass. Music Effect, Music Analysis and Percussion placed 10th, Visual Analysis 11th and Visual Proficiency 12th. Unlike in Minneapolis, when Percussion placed 13th, all captions finished in the top-12. Blue Knights (11th-78.65) placed 8th in Visual Analysis, up from 12th in Minneapolis. Visual Effect, Visual Proficiency, Color Guard and Brass took 11th and Music Analysis 12th. Music Effect and Percussion placed 13th. Blue Stars (12th-77.95) placed 10th in Visual Proficiency, 11th in Music Effect, Music Analysis and Percussion and 12th in Color Guard. Visual Effect and Visual Analysis placed 13th and Brass 14th, down three spots from last weekend. Crossmen (13th-77.55) had a bright spot in Color Guard, which placed 10th. Both Effect captions, Visual Analysis and Brass finished 12th, with Visual Proficiency and Music Analysis in 13th. Percussion placed 14th. Glassmen (14th-75.20) placed 12th in Percussion, 13th in Brass and 16th in Music Analysis. All other captions finished in 15th. The Academy (15th-74.60) had no captions in the top-12, unlike in Minneapolis, where three captions placed 10th, 11th and 12th. Color Guard took 13th, both Effect captions and Music Analysis 14th, and Percussion 15th. Brass slipped one placement to 16th, and Visual Proficiency did the same, to 18th. Visual Analysis plunged from 15th to 19th. Colts (16th-72.90) finished 15th in both Brass and Music Analysis, while both Visual Proficiency and Analysis ended in 16th. The corps slipped from 14th in Visual Effect to tie for 17th and slipped from 15th in Color Guard down to 19th. Percussion ended in 18th. Troopers (17th-72.60) were 14th in Visual Proficiency, 16th in Percussion, 18th in Color Guard and 19th in Music Analysis. All other captions finished in 17th, with Visual Effect tying with Colts. Pacific Crest (18th-72.35) placed highest in Visual Analysis, 14th place. Visual Effect and Color Guard took 16th, Visual Proficiency and Music Analysis 17th, and both Music Effect and Brass 18th. Percussion was 19th. Jersey Surf (19th-69.80) finished 17th in Color Guard and 18th in Visual Analysis and Music Analysis. Both Effect captions and Brass took 19th, Percussion 20th and Visual Proficiency 21st. Mandarins (20th-66.95) placed 17th in Percussion and 20th or 21st in everything else. Cascades (21st-65.10) placed 19th in Visual Proficiency and 20th or 21st in everything else, except for 22nd in Color Guard. Pioneer (22nd-62.60) was 21st in Visual Effect and Color Guard and 22nd in all other captions. In Open Class, Oregon Crusaders (1st-78.40) would have had exactly a 10-point spread over 2nd place were it not for a five-point penalty assessed for starting their program several minutes late. The corps took 1st in all captions. Genesis (2nd-73.40) took 2nd in every caption. Forte (3rd-66.45) placed 3rd in every caption except Color Guard, in which the corps took 4th. Revolution (4th-63.15) took 3rd in Color Guard and 4th in all other captions.